For other uses, see Fujin (disambiguation). The Japanese wind god Fūjin, Sōtatsu, 17th century. 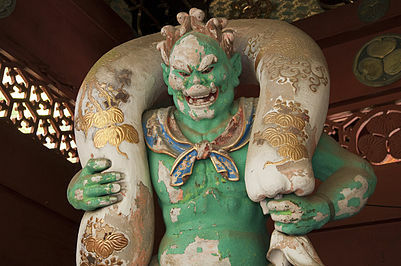 Fūjin (風神) or Futen is the Japanese god of the wind and one of the eldest Shinto gods. According to Kojiki, Fujin (Shinatsuhiko) was born from Izanami. Left: Greek wind God (Greco-Buddhist art of Gandhara), Hadda, 2nd century. Middle: Wind God from Kizil, Tarim Basin, 7th century. Right: Japanese Wind God Fujin, 17th century. The iconography of Fujin seems to have its origin in the cultural exchanges along the Silk Road. Starting with the Hellenistic period when Greece occupied parts of Central Asia and India, the Greek wind god Boreas became the god Wardo in Greco-Buddhist art, then a wind deity in China (frescoes of the Tarim Basin), and finally the Japanese Wind God Fujin. The wind god kept its symbol, the windbag, and its dishevelled appearance throughout this evolution. Wikimedia Commons has media related to Wind deities. Boardman, John (1994). The Diffusion of Classical Art in Antiquity. Princeton, NJ: Princeton University Press. ISBN 0-691-03680-2. Tokyo Kokuritsu Hakubutsukan; Hyogo Kenritsu Bijutsukan (2003). Alexander the Great : East-West cultural contacts from Greece to Japan. Tokyo: Tokyo Kokuritsu Hakubutsukan. OCLC 53886263. Errington, Elizabeth; Joe Cribb; Maggie Claringbull; Ancient India and Iran Trust; Fitzwilliam Museum (1992). The Crossroads of Asia : transformation in image and symbol in the art of ancient Afghanistan and Pakistan. Cambridge: Ancient India and Iran Trust. ISBN 0-9518399-1-8.